Great new entry to the Rifftone lineup! Compact and powerful... just like it's name sake. There are a few smaller power supplies on the market these days and some work very well, but still have plastic casing at times and look pretty fragile for extended use. 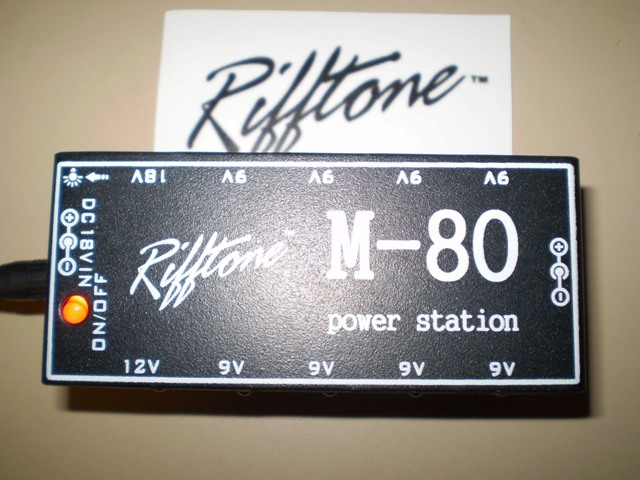 The Rifftone M-80 is housed in a nearly indestructible steel housing that is designed for the active musician. Do not let size fool you... this is a real nice little power supply that is designed to offer consistent power for your effects and to fit virtually anywhere on a pedal board. Measurements are: 1 3/4" W x 4 1/4" H x 1 1/2" D. Housed in a solid metal casing, but weighs only about 10 oz. 10 blue LED lights (on and off switch) for pedal board lighting & short circuit indicate & over current protected. Features Outputs for 1 DC 18V, 1 DC 12V, and 8 DC 9V . 18V DC output, the maximum output current is 100 mA. The Corresponding blue LED light would be flashing when the load current beyond 100 MA. 12V DC output, the maximum output current is 100 mA. The corresponding blue LED light would be flashing when the load current beyond 100 MA. 9V DC output, the maximum output current is 100 mA each. The corresponding blue LED light would be flashing when the load current beyond 100 mA. 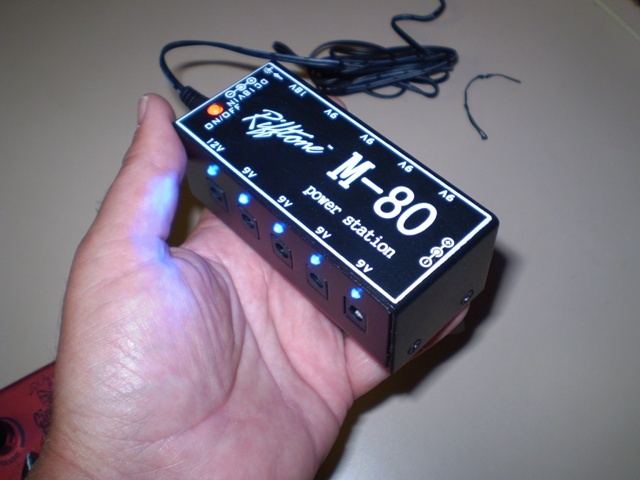 Plus.....1 special 9V output which features a full 500 mA (right below the 12V output). Based on your effect's rating, can most likely power 2-3 Analog effects if desired using a daisy chain on this special output. Includes power supply and all cable links to get connected with ease and rockin! 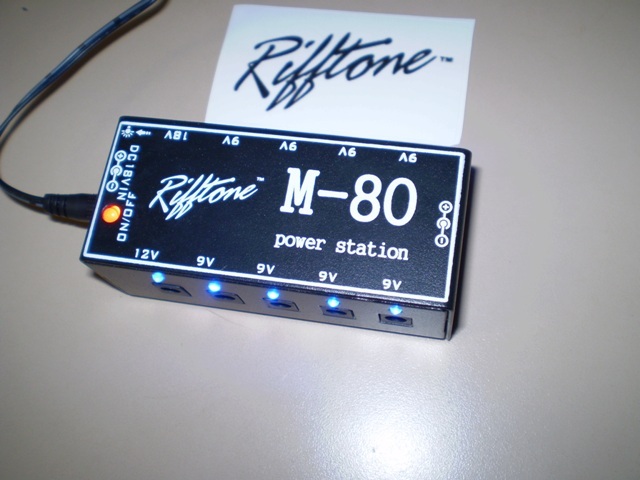 Remember to always check your power rating on specific effects to ensure that they are compatible with the Rifftone M-80. Great price on these powerful little effect power stations! !